SOUTH PORTLAND — A federal pollution lawsuit against a petroleum company that caught city officials by surprise this week will get a public airing when the City Council meets Tuesday night. The U.S. Environmental Protection Agency filed a lawsuit and consent decree Monday charging Global Partners LP with violating the Clean Air Act for several years at its petroleum storage facility on the Fore River. Morgan said he initially considered holding an executive session to review the lawsuit with attorneys because city officials were surprised and unsure of the legal and environmental implications when the case was first reported. Morgan said he still hoped to learn why neither EPA nor DEP officials notified the city directly about Global’s air quality violations or the pending legal action. The city has invited representatives of the EPA, DEP and Global to attend the meeting at 6:30 p.m. Tuesday. By Friday afternoon, EPA officials had declined the invitation because the lawsuit has been filed and the others had yet to respond, Morgan said. EPA and DEP spokesmen didn’t respond Friday to requests for comment for this story. The city also has hired an outside attorney to help decipher the complex lawsuit and determine how best to respond to the consent decree, which is subject to a 30-day public comment period and final court approval. Paul Driscoll and Adrian Kendall, lawyers with Norman Hanson Detroy of Portland, are expected to be at Tuesday’s meeting, City Manager Scott Morelli said. The city hired them to avoid a potential conflict of interest because Jensen Baird Gardner & Henry, the firm of city attorney Sally Daggett, has represented Global on real estate issues. While the lawsuit indicates Global is liable for potential Clean Air Act violations dating to 2004, the EPA issued violation notices in 2014 and 2015. Continuing high levels of volatile organic compounds were flagged again in 2016, when Global sought a “minor revision” to its emissions license from the Maine DEP. VOCs include a variety of chemicals that can produce adverse health effects such as eye, nose, and throat irritation, headaches, nausea, and damage to the liver, kidneys and central nervous system, according to the EPA. Morgan said EPA officials contacted him this week after the Portland Press Herald published his comments expressing dismay that city officials learned about Global’s air quality violations and the lawsuit from the newspaper. EPA officials told Morgan the situation in South Portland had prompted “an internal discussion” of how the agency could improve communication with local communities when violations are under investigation. Morgan said he suggested that the city should have been notified before the lawsuit was filed, if not before EPA lawyers negotiated a settlement with Global. Under the proposed settlement, the company must take steps to reduce emissions, pay a $40,000 fine and invest at least $150,000 in a program to replace or upgrade wood stoves in the community. The program would provide vouchers to help people replace or retrofit older wood-burning stoves with cleaner-burning, more efficient heating equipment. Morgan said getting input from the city might have helped the EPA negotiate a settlement proposal that would be more relevant to South Portland. He noted that city officials had applied for but never received a highly competitive EPA grant in 2016 that would have established a citywide air quality monitoring program as part of its municipal climate action plan. While talking with EPA officials this week, Morgan said, they recalled notifying the city of Global’s VOC violations when they delivered a PowerPoint presentation on the air quality monitoring program in February 2016. The presentation identified six bulk petroleum storage facilities in South Portland: Citgo, Global, Gulf Oil, Portland Pipe Line Corp., Irving and Sprague. It noted that the EPA had inspected those facilities eight times in the previous five years and had ordered two facilities to conduct VOC emissions testing. The presentation also noted the EPA had issued four violation notices to two facilities, but it didn’t name the facilities or provide any information about the violations. Global’s annual reported VOC emissions first spiked in 2012, according to a fever graph in the presentation. Gulf was the only other facility to show a slight overall increase in VOC emissions in the presentation. 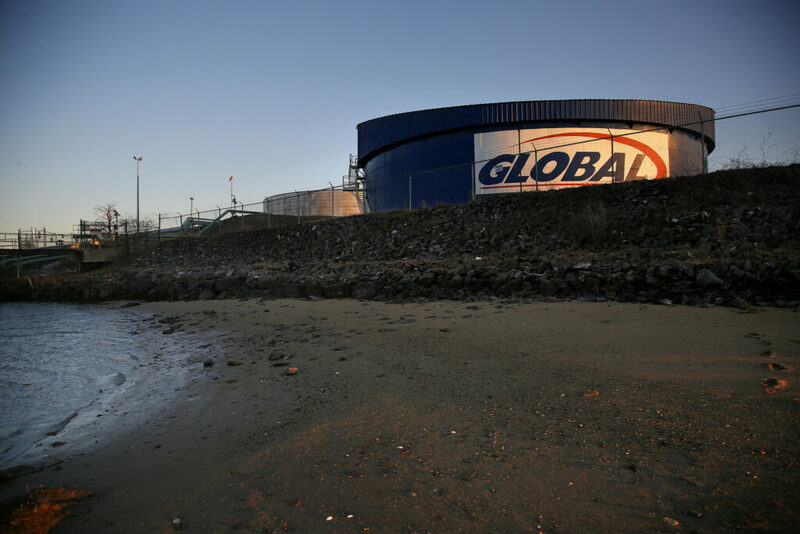 Based in Waltham, Massachusetts, Global operates 12 of the more than 100 large petroleum storage tanks in South Portland, many of which serve seven fuel terminals on the city’s waterfront. Global receives asphalt and heavy oil by barge or truck and stores the products until they are loaded into tank trucks or marine vessels for distribution, according to the EPA’s complaint filed in U.S. District Court in Portland. Global owned the facility before 2002 and is liable to pay civil penalties ranging from $32,500 per day for each violation after March 15, 2004, to $97,229 per day for each violation after Nov. 2, 2015, according to the EPA’s complaint filed in U.S. District Court in Portland.